Monday started off with a traditional English breakfast in the impressive dining hall of Corpus Christi. Then we were brought by bus through Oxford to OCDEM. 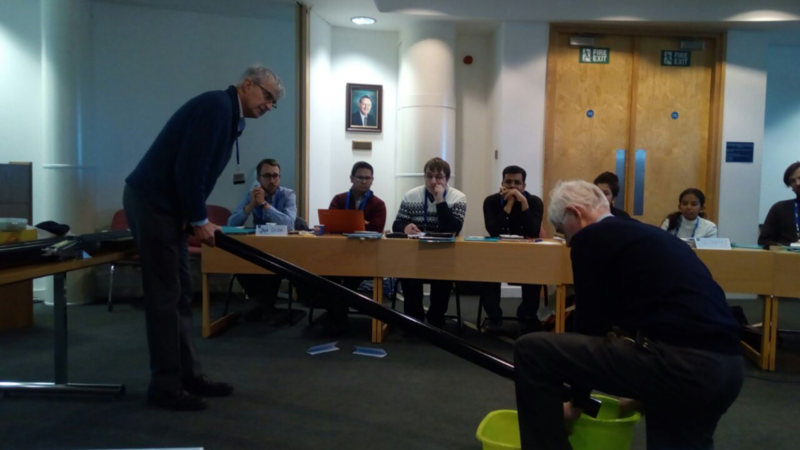 In OCDEM, we met Professor David Matthews, Dr. Anne Clark and Dr. Jonathan Levy and learned what was expected from us in the five days to come. After introductions, we had a session on numbers and their importance in research. Prof. David Matthews brought us back to the basics of research and challenged us to explore the different meanings a single number could have. The greatest example related to number of arms in population helped us fell the difference between “mean” and “median”. Continuing on from that, we got insightful sessions on physiological experiments, data collection, storage and verification. Prof. Jonathan Levy delivered us useful tips for dealing with raw data, which will help us work with them effectively. After lunch, we performed our first experiment of the week. The task was to figure out how to work with primary data and do simple statistics. We were armed with pipe, a scissor-jack, marbles and probability paper, and were divided into groups to start the experiments. We were testing how different angles of the pipe influence of the probability for marbles to get through the close or far hole. We got a great opportunity to carry out this simple physics experiment which turned out not to be that simple after all. Additionally, we were reminded how to use probability paper with logarithmic scale, a tool commonly used in biochemical and chemical kinetics research. The next lecture was the lecture by Prof. Brian Shine about exploring relationships in physiology and medicine and physiological models in endocrinology. We were introduced to the basics of fundamental endocrinology research. The day finished off with an overview of translational medical research and a session on hypothesis testing delivered by Rustam Rea and Jonathan Levy. Dinner has held in the Corpus Christi dining hall and followed by the annual International Evening in the company of Prof. David Matthews and Ms. Mary Hata. Afterwards, we gathered in the common room next to the Dining Hall for our International Evening. Mary had asked us in advance to bring something traditional from our countries. It could be some food, drink, national costume, music, photos, etc., representing our countries of origin to share with the group. We had an opportunity to try national baked products, sweets, drinks, see national clothes and listen to national songs. This excellent teambuilding activity gave us a great opportunity to get to know each other and the respective cultures of countries we are from. So, we had a sequence of inspirational lectures strategically presented to transform a non-initiated into a curious observer of robust science by the end of it. The International Evening gave a chance for us all to get to know each other in a more light-hearted way. It helped us to work more effectively during next days. Tuesday began with a group session where we discussed the role of clinicians, clinical scientists and scientists, where each group analysed a single perspective. The session analysed how clinical scientists are important in bridging the gap between scientists to pure clinicians. Then, following a lecture by Dr. Rury Holman on current clinical trials on Diabetes and Cardiovascular diseases, we had another session with Dr. Clark on effective use of literature where we reviewed and critically appraised recent literature in terms of relevance of their methodology, accuracy of their analysis and conclusions. Then followed a captivating session by Prof. Matthews on presentation skills, where what and what not to do on the scientific presentation was discussed. The few hours of the day left were devoted to planning the research experiment due on Wednesday. We were once again divided into groups of four and in these groups we spent the evening designing the exciting experiments we would be conducting on the next day. By the end of the day, each group had come up with a new research idea, developed a study protocol, planned data sheats and data analysis and had also assigned different roles to each member. Although the whole Robert Turner Course was organized in a very active manner, Wednesday was perhaps the most interactive day. The objective of the day was to conduct our own clinical experiment with analysis, interpretation and presentation of the data included. One day before all of this happened, we were randomly divided into groups of 4 participants with some time to brainstorm ideas for the hypothesis of our experiment. After a small tour of the CRU (Clinical Research Unit), we were able to plan an experiment with knowledge of the available facilities there. On Wednesday morning, some of us enjoyed a breakfast in Corpus Christi College, but the others - the subjects of our experiment - were not that lucky- they had to follow the requirements of experiment and their stomachs remained empty. After arrival in the OCDEM CRU, our experimental dreams were about to happen! The yellow group assessed glucose metabolism according to an OGTT after the intake of caffeinated/decaffeinated coffee. While the other groups did an acute session of exercise on a bicycle or the intake of the large volume of a mixed apples - those are just a few of the examples of what was happening on this exciting and educational day for us. On reflection, the group eating goats cheese and salmon, may have lucked out! After a lunch break, we had the pleasure of hearing an inspirational lecture by Dr Bruno Sgromo about the basics of bariatric surgery, followed by Dr. Eleanor Kennedy who gave us a whole host of useful tips on how to apply for a research grant. Right after that, we got the results from our own experiments, and that was the time for us to check if our hypotheses were right or wrong. With some researches of the current evidence on the problem, we tried to interpret our data in this context and summarize all of these into one comprehensive abstract and presentation. It wasn’t hard to imagine we were actually presenting at the EASD, whilst presenting in front of our colleagues and senior researchers Dr Clark, Prof. Matthews and Prof. Levy, who gave us very useful and immediate feedback on our work. We thoroughly enjoyed the teamwork and proved how effectively we could perform the experiment, the analyses, interpretation and presentation of our own data. It really was an unforgettable experience and brought a lot of laughter and fun to the week as a whole! After the all-exciting Wednesday, expectations for Thursday were low — after all, everyone had been to boring research ethics lectures at medical school. But Thursday was nothing as expected. After a week of absence, the sun had finally decided to make an appearance and the famous Oxford greenery appeared colourful as we took the short walk from Corpus Christi to Harris Manchester College. After introductions, Dr. Paul Chester and Dr. Tania Worth started the best interactive activity on Good Clinical Practice, timely interval by Pub quizzes and a lot of sweets and fruits. Following lunch in the College Dining Hall, Prof. Mathews conducted a small tour of Harris Manchester College — the youngest of its kind in Oxford but, nevertheless, a proud beauty. The chapel with its painted glasses was a sight to behold while the library was the perfect blend of old and modern. 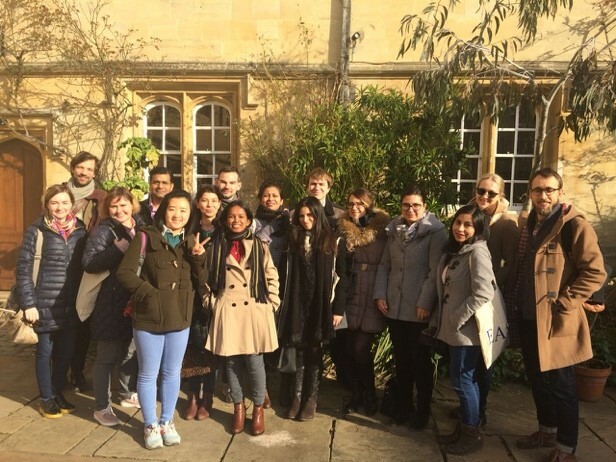 After the tour, the afternoon session of the Good Clinical Practice was resumed, followed by just enough time to do some wandering around Oxford peeking into its tourist stores. Thursday dinner was a formal affair with drinks in the Senior Commons Room followed by a delicious dinner, during which we had the great opportunity to meet Dr. Jennie Turner, widow of Dr. Robert Turner. After dinner, certificates of participation were awarded along with ‘Nobel Prizes’ for innovative research conducted the previous day. The last day of our great Robert Turner Course started at 9.00 A.M at OCDEM. Dr. Gary Tan, Sophie Roberts and Jodie Buckingham delighted us with an insightful and interactive session called ‘clinical conundrums: sorting the wheat from the chaff’. In order to make the group aware of the strengths and weaknesses of different types of research, we had to study a few papers that investigated incretin-based therapy in a different manner, including observational studies, randomized controlled trials and fundamental research previous to the course. Then, in good English fashion, we used the article in a parliamentary debate. We were randomly assigned to either the group against or the group in favor of the causality between GLP-1 recepter agonists and pancreatic cancer. In the following fierce battle, all possible arguments were used and misused to understand their full potential. After a short break to cool down, Prof. Anna Gloyn gave a detailed lecture called Genetic Research Ideas, which focused on the importance of the appropriate diagnosis in order to select the right treatment. In her informative talk, she went through several cases she had come across during her studies in Oxford, showing that specific genetic disorders can be helped a lot when treatment is tailored to the patient. For instance, permanent neonatal diabetes (PND) can be caused by mutations in the ATP-sensitive K+ channel subunit Kir6.2. Prof. Gloyn showed that they found in these insulin-dependent patients, by combining knowledge of genetics and pathophysiology, that sulfonylureas can be used to replace the insulin without deterioration of blood glucose levels. The last talk of the morning held by Dr. Hugh Davies and Jane Cheeseman confronted us with the ethics involved in research, in particular when study subjects are vulnerable. We discussed several methods to get informed consent from participants of a very young age or those who are mentally limited. Also, we talked about the guidance needed during such a study; the necessity of talks without parents or mentor, the importance of consistency in the research team and most importantly, the value of autonomy even in subjects of young age or with mental limitations. In some research areas, the scientific value of a study can collide with such values, and a careful examination of the balance between the two has to be made. An ethical committee can help researchers to do so. After lunch, we walked through all the facilities of OCDEM. In a quick tour, employees of OCDEM showed the outpatient clinic, laboratory, research area, diabetic unit, hall and all other areas of OCDEM. Memorablee parts of the tour were; 1. The old-fashioned microscope of Dr. Clark 2. The sun protection system tried to prevent the main hall from heating up too much 3. The enormous number of people who are in some way involved in research at OCDEM, and work so hard to solve the problems of the patients of today. After the tour, we took our bags that we had brought to OCDEM in the morning, said goodbye to everyone of the group and left for home, full of knowledge, inspiration and a LOT to think about in the days to come. We would like to say final heart-felt thank you to EASD and to Lilly Diabetes for their generous sponsorship for making this wonderful week in Oxford possible for us all.